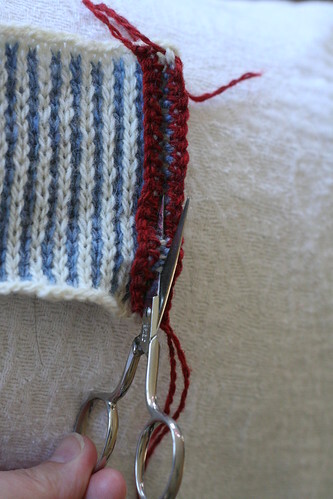 In the last few weeks, I have received more than a dozen emails about steeking, the technique of cutting one’s knitting. I always refer people to Eunny Jang’s Steeking Chronicles, because they provide a wonderful overview of why and how knitted articles are cut. 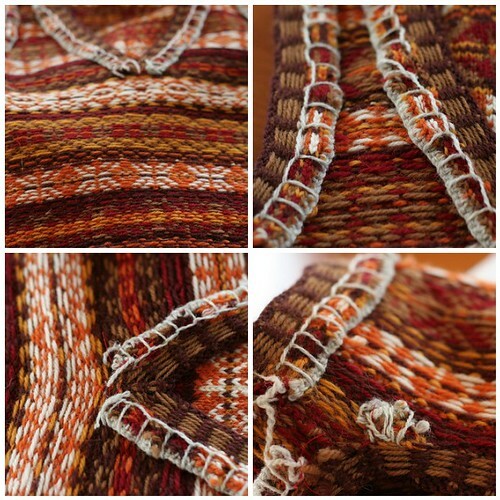 Eunny’s tutorial covers how to plan for steeks and offers an overview of hand sewn steeks, crocheted steeks, and a bit about machine sewn steeks. I would encourage anyone interested in steeking to read the entire series because it is well worth the time. However, for those who just want to know what they need to do to secure their knitting before a cut, I thought I would put together a really quick tutorial to cover the absolute basics of crochet and machine steeking. Why not? 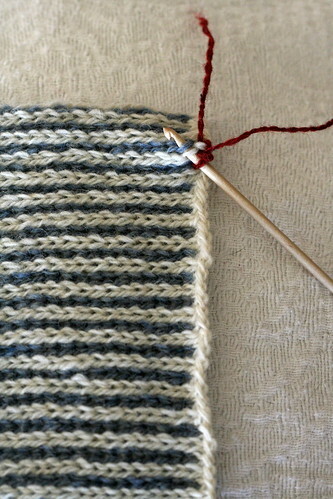 Would you rather purl back every other row? 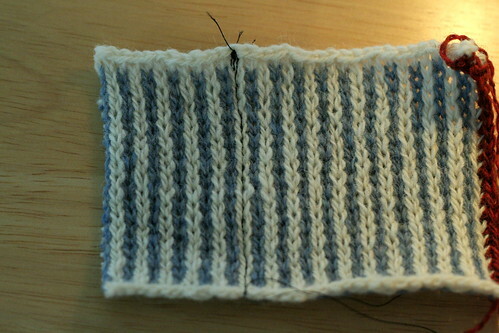 Or worse, purl back in a stranded color pattern? It’s easier and faster to work in the round with the right side facing you the entire time. 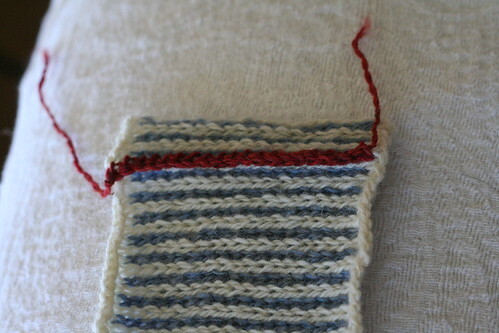 Although it sounds terrifying and difficult, cutting your knitting is shockingly easy to do. Really, it ought to be harder. The key to success is to support the edges alongside the cut to ensure they do not unravel. This support can come in several forms: grippy, feltable wool stitch fibers holding themselves and each other in place, or feltable crochet chains, machine sewn lines, or hand sewn lines running down either side of the cut site. If the garment is made using multiple colors of non-superwash wool at a very fine gauge, it may not even be necessary to add extra support; the wool itself will provide enough, felting together at the steeks over time. Indeed, many traditional Fair Isle steeks were not supported with crochet or sewing at all. 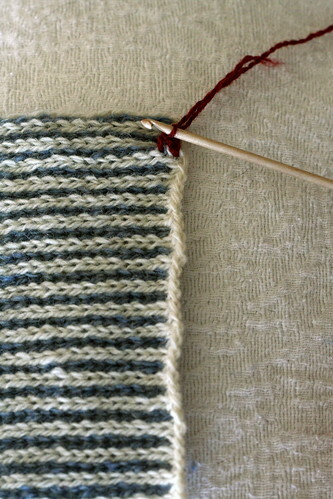 This tutorial applies to Fair Isle-style steeking, in which extra stitches are cast on specifically for the steek. 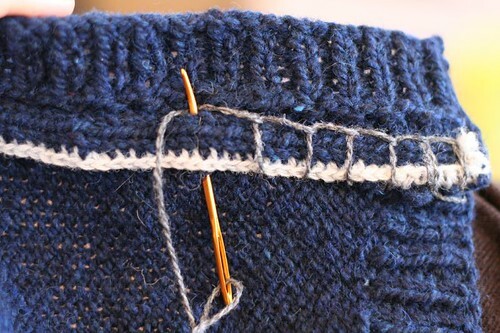 It should be noted that in Scandinavian-style steeking, the garment is worked in the round with no extra stitches; the cut is made directly into the garment pattern itself. 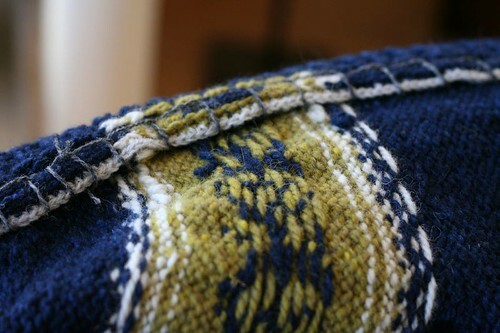 Most steeks in contemporary patterns are done in the Fair Isle style. Given the choice, I would prefer to use crochet chains over a sewing machine any day. I am clumsy with a sewing machine and I do not trust myself not to make a dumb, difficult to reverse mistake. Experiment with both methods to determine what works best for you. 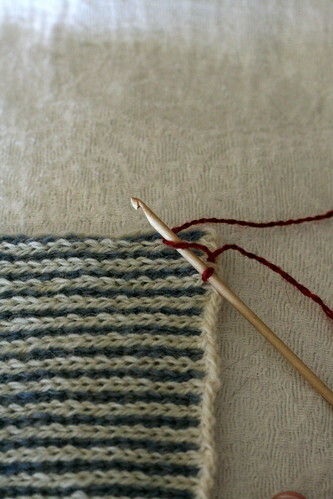 In the examples below, I will demonstrate the cut being made down the center of a column of stitches (as shown here, in Eunny’s steeking tutorial), although it can certainly be done between two columns of stitches. For my swatch and waste yarn, I used multiple colors of Harrisville Designs New England Shetland. 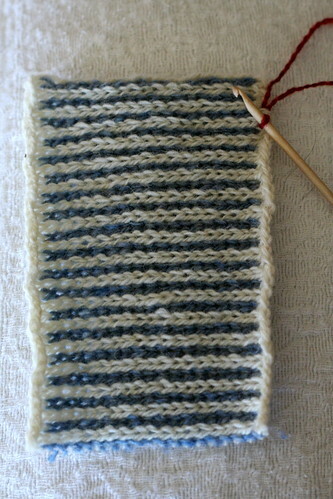 I knitted the swatch in stripes to make it easier for you to see exactly what I was doing. For a more detailed look at the pictures, click on any image to access higher resolution versions. Advantages: It’s fast, easy, and does not require sewing (or a sewing machine). Disadvantages: I would say it is not as secure as a machine-sewn reinforcement; however, given the proper yarn choice, it will be strong enough. Requirements: WOOL. Feltable animal fiber. Just say no to superwash wools, plant-based materials, and acrylics. This is not negotiable: the yarn must be able to felt and felt well. You will also need to have some feltable wool scrap yarn, a crochet hook several sizes smaller than the needles used for the garment, and be able to crochet a simple chain. Phenomenal crochet skills are not necessary: I learned to crochet only for this purpose, am barely able to produce more than a chain stitch, and have never had a steek fail because of my meager crochet skills. 1. ) 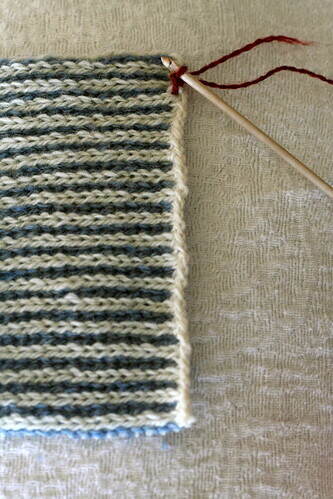 With the garment upright, turn the work 90 degrees so that the bottom edge of the steek stitches is on the right. 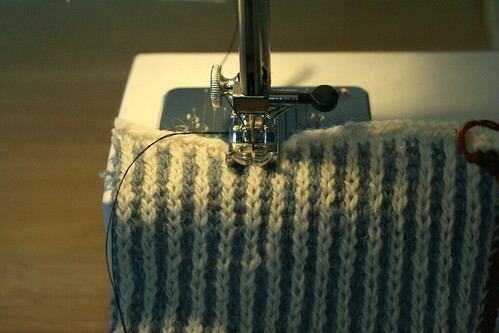 Identify one column of stitches as the steek column, the location of the cut. 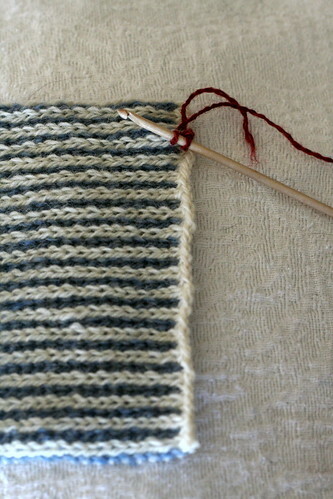 With a crochet hook, pick up the right half of the stitch to the left of the steek column stitch and the left half of the steek column stitch. 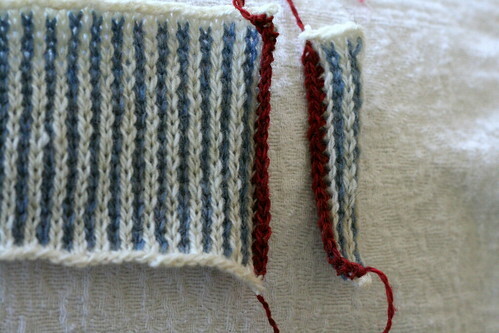 Since I casted my swatch with the white yarn, you will notice that the half stitches I picked up in this foundation row were both white. 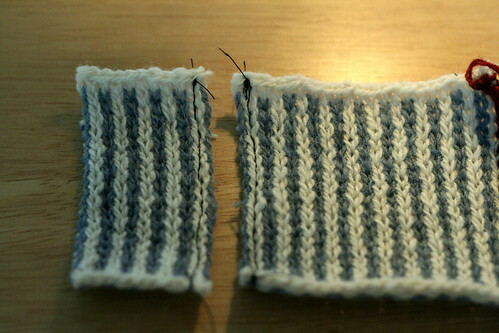 For every other row, the left one will be white and the right one will be blue, based on the striping of the swatch. 2.) With feltable scrap yarn, make a loop on the crochet hook and pull it through. 3.) Loop the yarn over the crochet hook once more. 4.) Pull through the first loop. There will be only one stitch on the hook. 5.) Here, you will see the beginning of a single crochet chain. 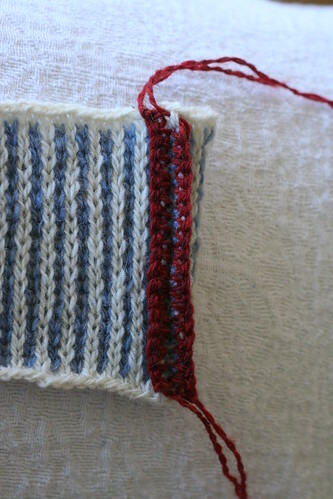 Continuing up the stitch columns, pick up the right half of the left stitch (white) and the left half of the steek column stitch (blue). 6.) Loop the yarn over the crochet hook again and pull through. There will be two stitches on the hook. 7.) Loop the yarn over the crochet hook and pull through both stitches. There will be one stitch on the hook. Now, turn the work 180 degrees. 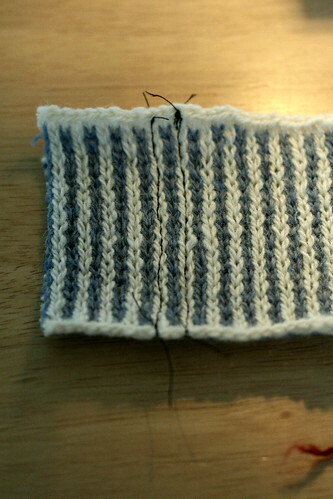 Repeat steps 1-7 outlined above, picking up the right half of the steek column stitch (blue) and the left half of the right stitch (white). 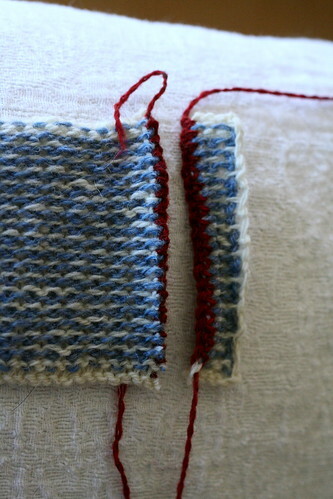 Return the work to the upright position so that the chains run vertically down the steek stitch block. Notice how the crocheted chains splay out to the sides. You will be cutting between the two chains, taking care not to snip ANY of the yarn used for the chain. Starting at the bottom of the work with small, sharp scissors, carefully cut up the middle of the steek column. Advantages: It’s fast, provides a very sturdy reinforcement, and can be used with any kind of yarn. 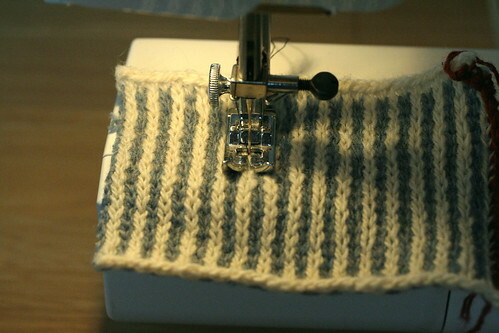 Disadvantages: Running the knitted fabric through the sewing machine risks catching floats on the sewing machine plate and distorting the fabric a bit. 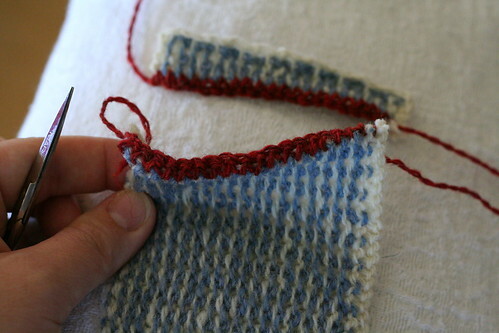 A line of tiny stitches will also prove difficult (I would say impossible) to rip out if you make a mistake. Requirements: A sewing machine (duh) and a small stitch setting. This can be done with fibers that do not felt as well as with those that do. 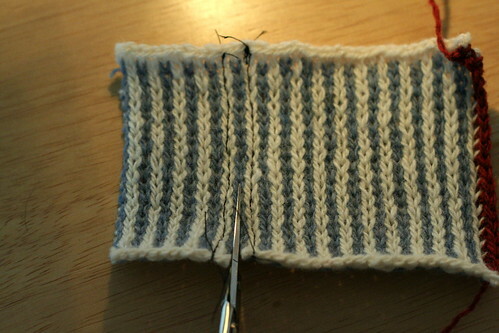 1) Identify one column of stitches as the steek column, the location of the cut (in my example, it is a blue column). 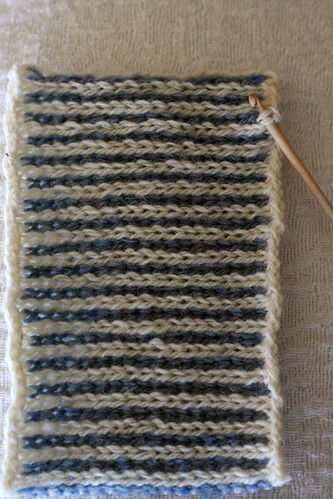 You will be sewing straight lines down the center of the stitch columns on either side of the steek column (shown in white below). Take care not to catch any of the floats on the sewing machine plate and try not to pull the fabric through, as this will distort the edge. 2.) Beginning at the top of the work, lower the sewing machine needle into the center of the first stitch to the left of the steek column. Before you sew down the entire column, it is best to backstitch a little bit to ensure the stitching will not unravel. 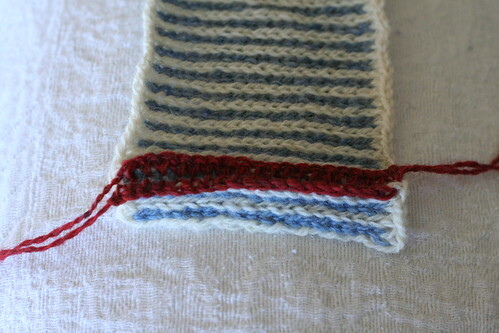 With a small stitch, sew a straight line down this column of stitches, backstitching again at the bottom. 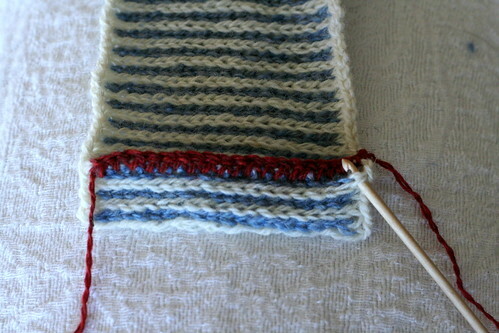 Repeat this process with the column of stitches to the right of the steek column. Starting at the bottom with small, sharp scissors, carefully cut up the middle of the steek column. OK, I cut it, what now? Now that you have a lovely, secured cut edge, you may be wondering what to do next. Chances are, the pattern will call for you to pick up stitches near the cut edge for button/buttonhole or armhole bands. Identify from where exactly (relative to the cut edge) those stitches will be picked up. Now, go forth and cut away!